"While the technical info is impressive, and the peerless sound is gloriously unaffected and real, the compelling and exotic blend of music on Equinox is equal to the technology—a balance of art and craft that all recordings, audiophile or not, should aspire to." Feature article and interview by Brian Dring, in The Other Caribbean column. "Schwartz shows his stuff on cuts like the opener "Ountò (Spirit of the Drum)" which really captures the varying cadence of the drums at a vodou ceremony, as well as on "Solo Tanbou" (a percussion duet with Ti-Roro) and "Koze Tanbou," yet without losing sight of the supporting role the vodou drums play within the frame of the music. So while this is ostensibly a solo project, Schwartz wisely stands back at times to let his guests help take the music where they may." Article and interview by Steve Desrosiers. "Markus Schwarz may not be Haitian by ancestry, but the soul of Ayiti finds voice in his trained fingers." "...Intent on finding that magic equilibrium between sound and content, Diament, a former Atlantic Records engineer, has hit a new high point for Soundkeeper with his immediate-sounding and musically compelling disc of explorations by drummer Markus Schwartz and his Lakou Brooklyn project..." "...While the technical info is impressive, and the peerless sound is gloriously unaffected and real, the compelling and exotic blend of music on Equinox is equal to the technology–a balance of art and craft that all recordings, audiophile or not, should aspire to." "Like Papa Legba holding a party at the crossroads where the great Haitian Master drummer Ti-Roro meets John Coltrane and they mix it up for a while. Best of all, we get to listen in... a fabulous fusion of Black musical styles blended and melded into a fresh and welcome innovation." 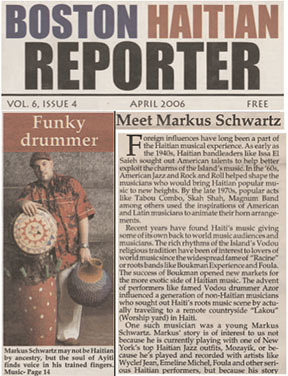 "Percussionist Markus Schwartz delivers another astonished and complex album inspired mostly from his rich experience with the Haitian culture as a whole. "Tanbou Nan Lakou Brooklyn" represents another gem to add to the royal crown of the rich Haitian Musical Experience. The drummer/percussionist ventures down complex avenues and calls on old musician friends and Jazz talents from the New York/international jazz scene to put his ideas into acoustic sounds and expressive colors. Flanked by an impressive cast of highly qualified musicians, Mr. Schwartz, meticulously assembled a collection of past experiences stamped by profound, comprehensive Lakou learning and a clear vision for a multi-form black musical language; an eclectic expression of the Black Diaspora."